The morning of June 7th did not presage any great change, save for a sultry wind blowing thirty miles per hour and a temperature that was to reach 88 degrees. 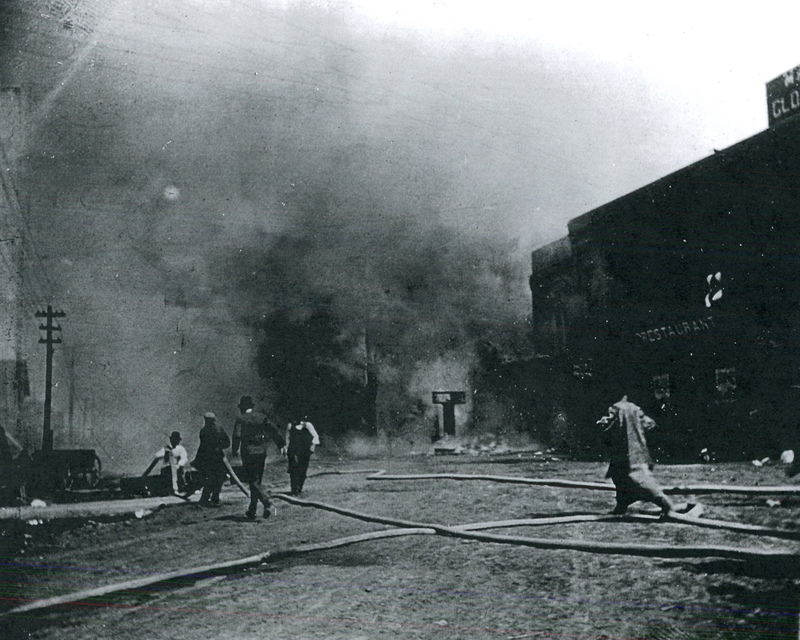 At 2:15 on June 7th, the “fire laddies” were called to deal with a fire that seemed to have started behind Herzman’s Dry Goods store on 512 Front Street. The beginnings of the fire proved to be somewhat controversial. As a young man, John Hannaher was to bear witness to the events. According to his remembrance “the fire started back of the store next to the corner of Broadway and Main Avenue. The back of that, there is someone in back of the Herzman store to burn some rubbish, it caught onto the store and then it spread.” In his own remembrances, John’s brother Thomas was to repeat this information on the start of the fire. The owner of Herzman’s Dry Goods did not accept this story, however. It would seem likely that he was uncomfortable to be so directly associated with the destructive fire that overtook Fargo’s business district. Herzman did, however, find a great deal of support for his assertion that the fire did not start from the rear of his store but rather from an adjoining building.Local businessman Max Stern was one of the first individuals on the scene, as his business was close to the beginning of the fire. He noted that by his arrival, the fire had not yet taken hold of Herzman’s Dry Goods. J. B. Folsom claimed to be the first person reaching the point of origin of the Fargo fire, and he was “well satisfied that it started on the outside of the frame building to the west of your store and when I reached the fire it had not reached your store building.” The accounts of E. F. Steele and L. S. Seare supported this sequence of events. The strongest indication that the conventional wisdom on the beginnings of the fire being incorrect came from Sam P. Kelly, the superintendent of the water works. Kelly was the individual who pulled the alarm to announce the fire, and stated positively that the origin of the fire was not the Dry Goods store. He indicated that the origin of the fire was several doors west of Herzman’s. The statements to this effect were provided by Herzman, and are to his own benefit. The statements do effectively contradict other accounts, and seem very valid. The story of Herzman’s Dry Goods rubbish being the origin of the Fargo fire seems to have a similarity to the story of Mrs. O’Leary’s cow being responsible for the devastating fire from years earlier in Chicago. Both have become accepted as accurate, though both also seem to be somewhat mythologized. The statements also contradicted the story of the fire starting at the rear of the Little Gem restaurant due to hot ashes blowing to Herzman’s. Despite the unclear beginning to the fire, the events that followed were well documented. Oral interview with John Hannaher, NDSU Institute for Regional Studies. “Special Fire Edition,” Argus (Fargo, ND), June 7, 1894.